At every Zones show there are eight individual undergraduate classes which means up to 16 people could go forward to IHSA Nationals in these classes by placing first or second. 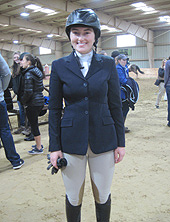 At Zone 4 Zones on April 6th six riders from Region 2 managed to place inside the top two in these divisions, including Molly McLaughlin of Randolph College. Seen here at the February 2018 Hollins show McLaughlin won the individual novice fences. The sophomore from Owings, Maryland would win consecutive classes on April 6th, as she was entered in team intermediate fences for the Wildcats which was up next and also went McLaughlin's way. 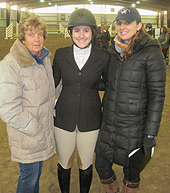 University of Virginia coaches Sarah Irvine (on left) and Laurie Turner (on right) pose with Jessica Casolari of the Cavaliers at the February 10th Randolph College show. Casolari had just competed in novice fences and would in fact win the class. Nearly two months later the senior from South Hadley, Massachusetts would finish second to McLaughlin in individual novice fences at Zones which meant Region 2 riders had the top two ribbons in the division on April 6th and thus both go on to Nationals. 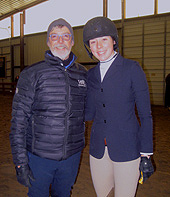 Another UVA rider, Zoe Lewczak, was second in individual intermediate fences later that day at Zones meaning two Cavaliers will be competing at 2019 IHSA Nationals in Syracuse, New York on May 2nd. After a decade at Virginia Tech (most of it spent as the head coach) Sherri West became the new head coach at Hollins University for the 2018-19 season. 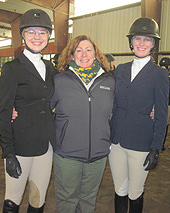 West is seen here between Hollins freshman Caitlyn Sheffer (on left) and senior Maddy Lohr, each of whom rides in the open divisions for Hollins. Sheffer's season is still going, as she won individual open on the flat and placed second in individual open over fences at Zones on April 6th. From York, Pennsylvania, Sheffer is the only Region 2 rider who will ride in more than one individual class at 2019 IHSA Nationals. 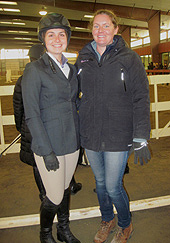 Three Region 2 riders won individual classes at 2019 Zone 4 Zones and Sydney Remaily of James Madison University was the first to do so. From Horsham, Pennsylvania, Remaily is seen here at 2017 Region 2 Regionals which were held at the Barracks in Charlottesville. And two years later the Barracks was the site of Zones where Remaily won the individual intermediate flat ahead of wins for Sheffer and McLaughlin in the individual classes which followed. 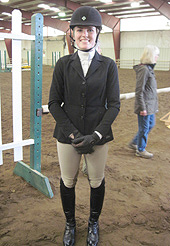 The first Region 2 rider entered at Zones to clinch a spot at Nationals was Georgia Osborne of Bridgewater College. 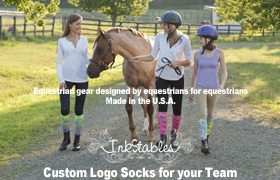 From Culpepper, Virginia, Osborne was at one time an NCEA rider with Delaware State University. Now a junior Osborne was second in individual novice flat at Zones on April 6th ahead of the other Region 2 riders already mentioned who joined her at Nationals as Zones progressed. Washington and Lee University co-hosted with Randolph College at the latter's facility on February 10th. Washington and Lee head coach Gordon Reistrup (on left) brought and schooled horses that day and likely did so two weeks later when the Generals co-hosted with Hollins. Seen here with Reistrup is open rider Samantha Johnson. A freshman from Princeton, New Jersey, Johnson spent part of the season leading the Region 2 open rider standings before Kirby Tidmore of Randolph (not pictured here) took the lead and kept it. Johnson qualified for Regionals in open flat (and might have done so over fences as we are hoping for one more update involving the last two shows of the season). Seen here in the lounge inside Claire Noyes Cox arena at the Randolph College Riding Center is Hallie Manchester of Roanoke College. 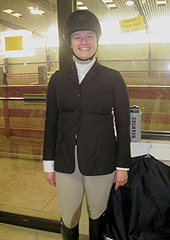 From South Kingstown, Rhode Island, Manchester was one of two Roanoke riders qualified for Regionals though February 23rd. 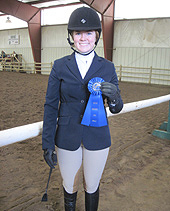 Manchester finished her junior year by placing ninth in individual walk-trot-canter at Zone 4 Zones on April 6th. James Madison University's Allison Wellener (on left) and head coach Brianna Stone are seen here at that same February 10th Randolph/Washington and Lee show. From Chesterfield, Virginia, Wellener qualified for Regionals in novice fences in what was her senior year with the Dukes. 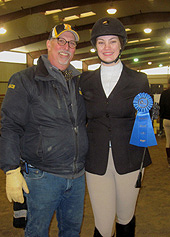 Caroline Powell of the University of Virginia poses with her Father after she won her novice flat class on February 10th. A senior from Midlothian, Virginia, Powell qualified for Regionals in the division and perhaps did so with this particular ride. It was an emotional day for many on February 10th, as it was previously announced that following the conclusion of the 2018-19 season Equestrian will no longer be a varsity sport at Randolph College and that their riding center would likely be sold off by the school. Therefore it was probably the last time that Randolph would host at the Claire Noyes Cox arena. 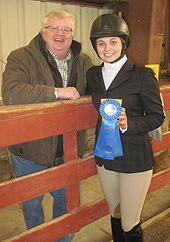 The last rider of the day to win a blue ribbon (not counting the ride-off, which was a 'question-off') was Katherine Brown, or "Downtown Katie Brown" as she is known by her Randolph College teammates. A sophomore from Winchester, Virginia, Brown poses with Wildcats head coach Chris Mitchell after winning the walk-trot at roughly 3:56PM that afternoon. Despite many of his riders transfering over the previous twelve months Mitchell still guided Randolph to a third consecutive Region Title. Prior to Mitchell's arrival at Randolph in 2012 the program had but two Region Titles in their long history dating back at least into the early 1980's if not the late 1970's. Schools which competed in Zone 4, Region 2 during the 2018-2019 school year: Bridgewater College, Hollins University, James Madison University, Randolph College, Roanoke College, University of Lynchburg, University of Virginia and Washington and Lee University.